Getting a few people engaged and involved is far more important than attracting a big crowd. While you can engage in a face-to-face manner with, say, 50 percent of the people in a conference of 40 people, and 25 percent in a crowd of 80, it doesn’t drop to 5 percent when the crowd hits 400, but maybe 1 percent. And if the crowd is 800 or 1,000, there’s very little engagement with anyone aside from some handshakes, book purchases and selfies. Size promotes passivity. When the group gets bigger, we become more of an audience, less of a family and community. You can’t be or feel engaged in a group when there are thousands, or even a few hundred people in the room. Size promotes passivity. When the group gets bigger, we become more of an audience, less of a family and community. Healthy big churches know this, which is why they’re always encouraging their members to join small groups and ministry teams. For small church pastors, this should be very encouraging. In small churches, we don’t have to work hard to get people into groups small enough to engage, because we’re small already. We need to stop stressing about getting more people into the room, and get to work on helping them become more engaged. Engaged in relationships with Jesus, with each other, and with the people in our neighborhoods who need to be reached. 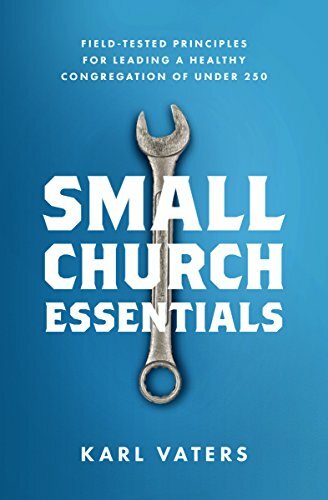 The small size of your church is not an impediment to becoming a healthy, connected and effective, it’s an advantage! It’s far easier to get half the church (or more) involved in ministry when you have 50 members than when you have 500 or 5,000. Because of this inverse correlation between size and engagement, if you have 1,000 people spread out over 10 healthy churches there will be more people involved in hands-on, effective ministry, fellowship, worship, evangelism and discipleship than when there are 1,000 people in one healthy church. While it’s much easier to get people engaged in a smaller congregation, it doesn’t happen on its own. Small churches don’t engage and activate people just by being small. We have to work at it.